Here you will find information and resources to help you enrol new EAL pupils and communicate with their families and carers. Multi-lingual background information collection tool – This is a very useful tool to communicate with parents or pupils who do not have a lot of English and collect background information about new arrivals. It has been produced by South East Grid for Learning and is free to use. “This online questionnaire is presented in a range of different languages with additional support from audio buttons that provide an oral version of each question. The tool has been designed to minimise the amount of typed responses, so most questions only require the user to select from a list of options, although space is sometimes provided for the user to type in extra information.” Please note that this website does not allow you to save the information, so it has to be printed out immediately. Bristol Secondary Schools EAL Induction Pack – an excellent resource containing a variety of resources for use with new arrivals. http://www.littlelearner.eu/#home – free interactive resources to support communication with New Arrivals. In this short video Brian Huxley, the creator of Little learner, shows how to use this tool: https://www.youtube.com/embed/JqMYT7RLBWo. Click here for information for parents about the Scottish Education System, translated into various languages. Toolkit-for-Diversity-in-Primary-Schools.pdf	(63 downloads) “This ‘toolkit’ aims to help schools create and sustain a welcoming and inclusive environment for pupils and parents from all backgrounds and ensure equal access for all” produced by Education Support for Northern Ireland. Toolkit-for-Diversity-in-Post-Primary-Schools.pdf	(46 downloads) “This ‘toolkit’ aims to help schools to create and sustain a welcoming and inclusive environment for students and parents from all backgrounds and ensure equal access for all.” Produced by Education Support for Northern Ireland. 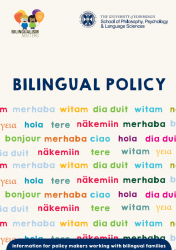 Bilingual Policy: Leaflet from Bilingualism Matters, University of Edinburgh School of Philosophy, Psychology and Languages Sciences.